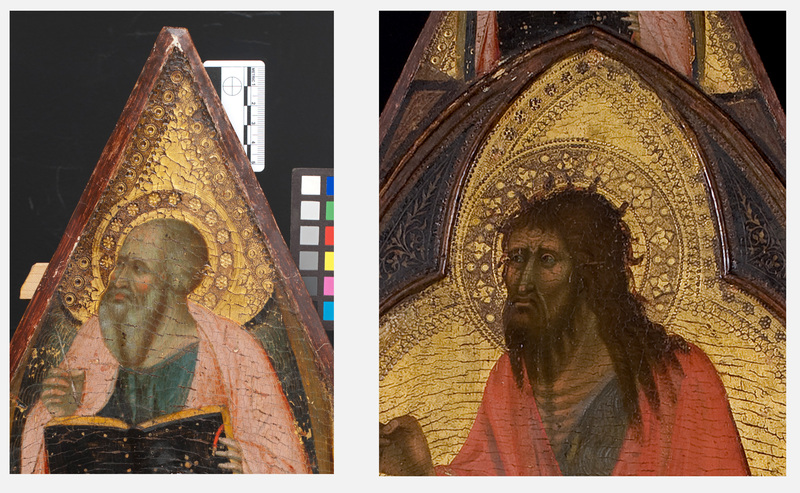 Gold tooling held an esteemed position in Trecento art-making, arguably equal to that of painting itself. As Cennino Cennini comments before giving explicit directions: “This stamping which I am telling you about is one of our most delightful branches.” [i] After studying and restoring the panel of St John the Baptist, in the Kress Collection of the Austin Arts Center, Trinity College, I readily agree with Cennini’s sentiment. However, when this painting of John the Baptist came to the Conservation Center in the fall of 2011 for examination and treatment, it was difficult to appreciate how the punched gold would have once glittered in candlelight. The entire painting was coated with a very discolored varnish, which, along with centuries of grime and soot, filled the crevices of the punchwork. 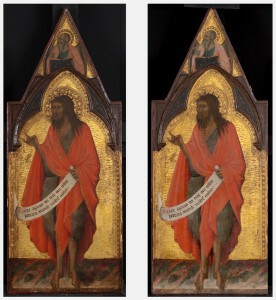 Furthermore, the varnish masked the beauty and subtlety with which John the Baptist had been painted, with John the Evangelist in the pinnacle above. The painting has been attributed to a follower of Pietro Lorenzetti, possibly Tegliacci, on stylistic grounds. [ii] Removing the discolored varnish brought to light the high quality of the painting and further supported this attribution. The intensity of the Baptist’s expression was particularly striking, accentuated with deeply furrowed brows as he gazes towards the left, where a Madonna and Child panel would likely have been located in the altarpiece’s original format. 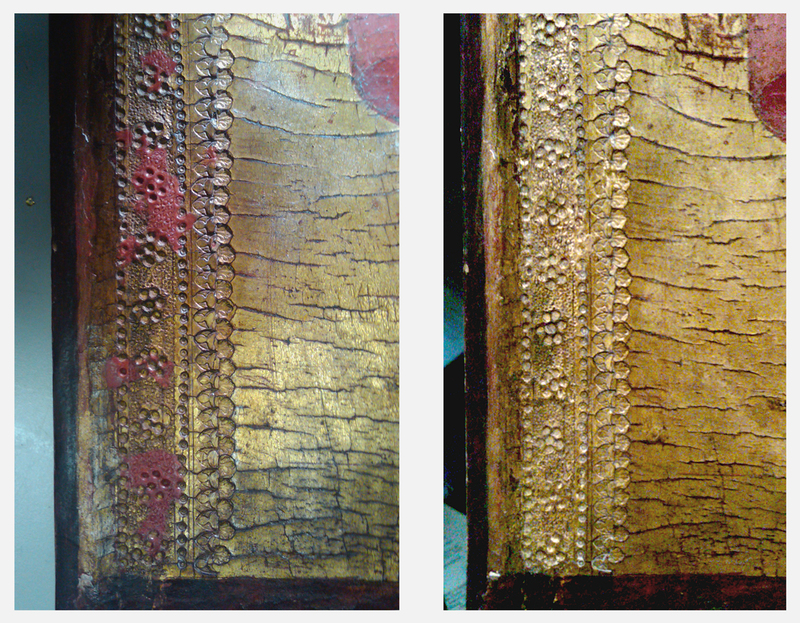 Moreover, after cleaning the punchwork, I studied the individual punchmarks and was able to match them to those marks documented on panels attributed to Pietro and Ambrogio Lorenzetti. 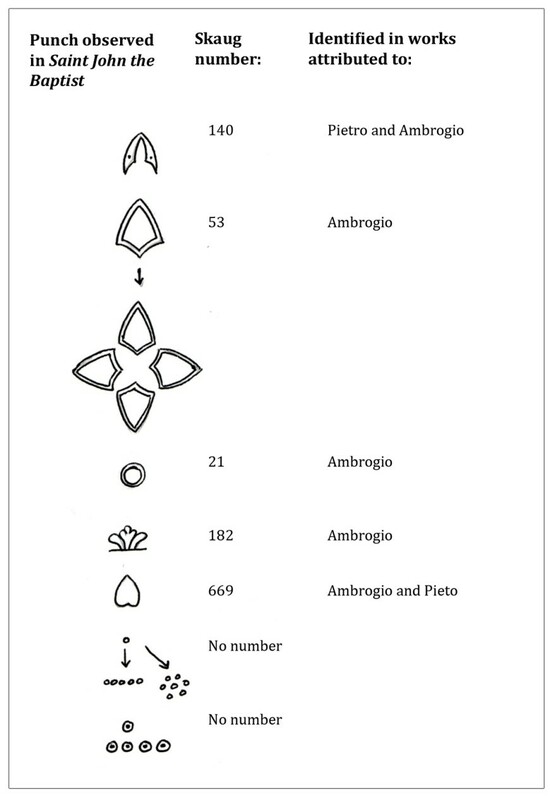 This overlap does not necessarily point to joint authorship, as the Lorenzetti brothers seem to have shared these precious tools between their workshops. However, the identification of the punchmarks in the Kress Baptist does support the hypothesis that this work was done by a follower of one of the Lorenzetti brothers, who may have had access to both of these workshops’ punches. 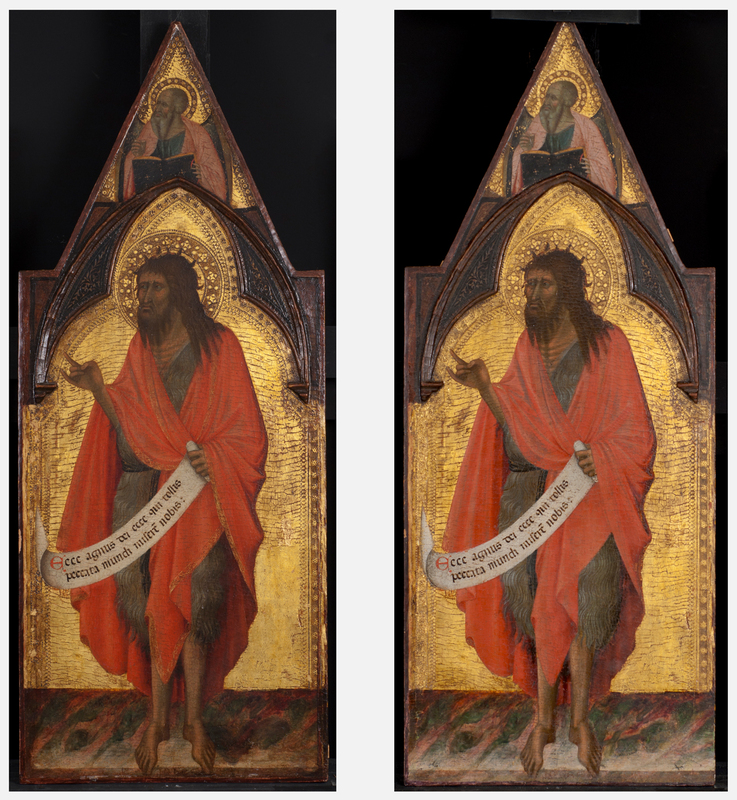 While the painting is generally in good condition, there are a few areas of loss that are the natural result of its history as a devotional object, and others caused by the splitting of this panel from the larger polyptych. 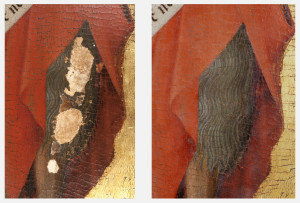 These losses detracted from the painting’s quality and needed to be re-integrated. There were three kinds of damage that needed to be addressed. A large area of the gold ground had been re-gilded at some point, which had a different crack pattern and so drew attention away from the painted figure. And so I painted cracks, using a reversible medium, to harmonize this region. Right: Before treatment. Left: After treatment. 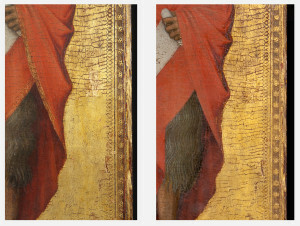 The punchwork had been damaged at the left side, likely when the painting was split from the rest of the altarpiece. I made new fills using a wax resin, toned a deep red similar to the color of the original bole, then new punched marks in imitation of the original and gilded the passage with 24 kt Florentine gold leaf. Left: Left edge after creating red wax fills. Right: Left edge after gilding new fills. A few losses to the paint, the shape and position of which suggests candle burns. I integrated these with mimetic retouching. Left: After cleaning. Right: After retouching. [i] Cennino Cennini, Il Libro dell’Arte, trans. Daniel V Thompson (New Haven: Yale, 1933), 85-86. 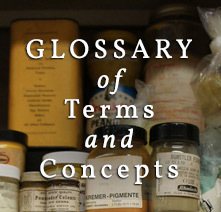 [ii] Fern Rusk Shapley, Paintings from the Samuel H. Kress Collection: Italian Schools XII-IV century (London: Phaidon, 1966), 53. Most notably its similarity to the Baptist in an altarpiece in the Siena Pinacoteca signed by Tegliacci and Luca di Tommè. 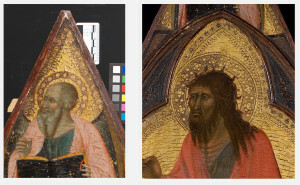 [iii] Bomford et al, Art in the Making: Italian Painting Before 1400 (London:National Gallery Company, 1989), 26. [iv] Erling S. Skaug, Punch marks from Giotto to Fra Angelico: attribution, chronology, and workshop relationships in Tuscan panel painting: with particular consideration to Florence, c. 1330-1430. Oslo: IIC, Nordic Group, 1994, 61. [v] Erling S. Skaug, Punch marks from Giotto to Fra Angelico: attribution, chronology, and workshop relationships in Tuscan panel painting: with particular consideration to Florence, c. 1330-1430. Oslo: IIC, Nordic Group, 1994, 224-5.